Throughout the past forty years, FUMC been deeply committed to serving those most vulnerable in our city. Service to our community is in our church’s DNA. Every Sunday morning for many years, we have provided a meal, coffee, clothing and hygiene items for our unhoused brothers and sisters. In October of 2017, we expanded our efforts to serve those in need by purchasing a mobile shower unit, including six shower stalls. Now, every week we are able to provide clean showers along with breakfast, coffee, clothing items, and hygiene items for our unhoused neighbors. During the holidays we offer special meals along with seasonal gifts. In the winter, blankets and jackets are collected and distributed. Sunday mornings have become a time of nourishment for all individuals involved as relationships are built and a stronger community is formed. The bonds that have been made over the years have been long-lasting, and many people who have come through our ministry are excited to give back and serve alongside us! 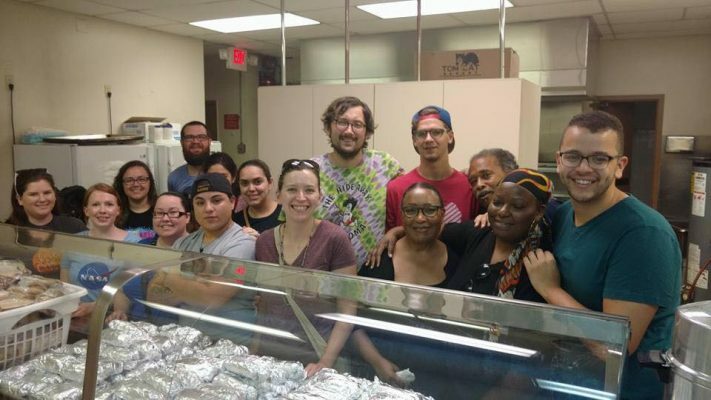 In partnership with Feed My Sheep of St. Philips Episcopal Church, we also provide showers and a meal on Wednesday mornings as well as a meal on Friday mornings. We prayerfully ask you to consider partnering with us to serve those in need downtown! If you are interested in getting involved, you can sign up at the link below to help with our showers or serving the meal on Sunday mornings, or you may volunteer to host a PB&J party to prepare the bags to be distributed on Sundays. This is a great opportunity to get to know others while making a difference in our city! To find out more about how you can help, please contact Kipp Nelson at knelson@firstchurchmiami.org or call the church office at 305.371.4706. In the spring, FUMC hosts a “Foot Washing” in honor of the act of service that Jesus offered to his disciples. On a Saturday afternoon we welcome our homeless brothers and sisters into the Fellowship Hall for their feet to be washed. Podiatrists from Barry University come to attend to the needs of each person. And one of our partners, “Soles for Souls,” provides a new pair of shoes for each person. Last year nearly 300 were served. It is one of the most anticipated events of our church’s year as it reflects with such clarity our role as servant to the community of Downtown Miami.